"Fewer than 15 North Island brown kiwi are thought to be surviving in western Bay of Plenty, sparking fresh fears for the survival ... will be extinct there within four years unless action is taken..."
"Humans may not be entirely to blame for wiping out moas ... a huge moa population existed in the few thousand years before the arrival of humans..."
"The Department of Conservation is failing to stop the slide to extinction of more than half of New Zealand's rare plants and wildlife..."
"Conservation Minister Chris Carter today announced a $7 million project to create two island sanctuaries for threatened native wildlife..."
Tieke calls are sounding again at Boundary Stream, an hours drive inland from Napier. If successful, the reintroduction will be a conservation first for the striking, native bird. 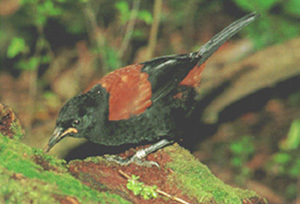 In moving North Island saddlebacks from a Coromandel island to the 800 ha (2,000 acres) native forest reserve, the Department of Conservation is testing whether its pest control is good enough to protect tieke, a bird that disappeared from the mainland in the mid-1800s. Where possums, stoats, weasels, ferrets, rats, cats, goats and deer are controlled to low densities - a costly proposition - the outlook is good for flightless birds, kokako, whio, frogs, bats, snails, and potentially tuatara. Tieke are now being tested. Other species are difficult to protect, for many reasons. Individual kea range over huge distances and live in areas that are relatively inaccessible to humans but not to stoats. Stitchbirds compete poorly against more numerous tui and bellbirds and often need supplementary feeding. Lizard populations are often thinly distributed over large areas. An inter-agency report to Ministers showed that DOC was doing well on offshore islands and at intensively-managed mainland island sites, but declines were continuing elsewhere. Aware of the conservation challenges, the Government aimed in its 2000-2020 Biodiversity Strategy to "halt the decline in New Zealand's indigenous biodiversity". The task has been proving a major challenge. "It is important that we extend the work done at intensively-managed areas to more than a few dots on the map, and keep up the research," says Conservation Minister Chris Carter. "Developments in many areas are encouraging. We set up the five kiwi zones in 2000, for example. DOC is now putting Operation Ark in place, an emergency response system for predator plagues, initially at three South Island beech forest sites." Mr Saunders says the mainland islands were the main inspiration behind the kiwi zones and Operation Ark, as well as dozens of private and community-based projects around New Zealand. "We will have to wait till the tïeke settle in and show signs of breeding this summer before calling the translocation a success," Mr Hunt says. "If we are lucky, any problems with weather, predators and competitors for food won't affect the birds too much. In any event, Cuvier Island has reached its carrying capacity of tïeke and the population there produces 200 chicks a year, so even if things don't work out here, we haven't really lost anything. On the contrary, we will have learned more about tieke and their conservation. Taking managed risks is what conservation is about." Six mainland islands were set up with special funding in 1996: Boundary Stream, northern Te Urewera, Trounson Kauri Park in Northland, Paengaroa reserve near Taihape, Rotoiti in Nelson Lakes National Park and Hurunui in inland Canterbury. "Mainland 'islands' are the spearhead of our conservation efforts, where we have shown that we can control several pest species at the same time, that we can measure the results, that we can protect and recover native species like kokako on the mainland. The question is whether we can control pests to low enough densities on an ongoing basis to allow tieke to survive and thrive." At Boundary Stream 70 stoats and 93 cats were trapped in 2003-2004. Kereru now number close to 4000, up on 3400 the previous year, and kiwi, 21, up on 14 a year ago. Results like these give confidence for bringing back tieke, says Ken Hunt, DOC Napier Area manager. Yet, Boundary Stream has had its share of setbacks. Only two pairs of five kokako in captivity bred in the last year, and an adult and a juvenile have since died, possibly because of stoat predation. Robin numbers there have not been increasing. "We can get predator numbers down to very low levels but we cannot stop them walking into the reserve. The idea is to limit the amount of time pests spend there before they get caught, which means some predation will always occur". One ferret killed five kiwi in a fortnight before it got trapped. There was the time of year the reintroduction occurred - when birds were gearing up for breeding and more likely to settle at Boundary Stream than disperse, but with a risk of acclimatisation problems in leaving warmer climes at sea level for late winter cold at 600m altitude. Questions remain over the effects of hedgehogs and mice at Boundary Stream, and whether they would limit the carrying capacity of the forest for tieke. Tieke eat insects and grubs, as do hedgehogs and mice which are tricky to control. Mice, being small, may never run into poison baits or traps, and hedgehogs usually avoid both. The larger insects and other invertebrates have not increased in abundance as much as anticipated with possum and rat control. Are hedgehogs and mice responsible for this, and, if so, how to control them, asks Chris Ward, a scientist with DOC's East Coast Hawke's Bay Conservancy. While 190 hedgehogs were trapped in 2003-2004 at Boundary Stream, the real question is how many are left behind, he says. Research has shown that the reserve may contain up to 4000 hedgehogs some autumns before numbers drop off over winter. Removing 4 per cent of the population a year would have no impact. With each animal eating 200 grams of invertebrates a night, hedgehogs must impact heavily on this key part of the ecosystem. Then there are the mice. DOC staff know that mouse numbers at Boundary Stream stay moderately high year round, thriving in the gaps between the bait stations which are spaced 150m apart to target mainly rats and possums. Copyright © 2004 TerraNature Trust. All rights reserved.